Well the box set starts with the classic theme tune, not a new interpretation of it, the genuine article, with Delia Derbyshire's swoops and howls, so that gets you in the mood right away. Then the action starts in a shop. You know you're in a shop because you hear the bell as the door opens, just like they used to have in the Seventies. The whole soundscape is lovingly researched to just make it sound right for that era. You probably wouldn't notice if these things weren't there, but you also wouldn't feel transported back to any particular era either. Then we have the incidental music as the double whammy, using the same sounds and style from Tom Baker's time pinning you right back at Saturday Teatime, so much so, you can almost taste the heavy bread and tinned ham sandwiches. So the first part of their Time Machine isn't a blue box, it's actually a crack team of time travel specialists in music and sound design, equipped with audio vortex manipulators, in this case both wonderfully handled by Jamie Robertson. The co-ordinates are programmed by the wonderful writers, taking us to all the amazing times and places in this set. Andrew Smith kicks us off with The Sinestran Kill, and he should have no trouble recreating Tom's era, as he wrote Full Circle for Tom back in his TV days. But after writing that, he went on to work in the Police Force, so was particularly well suited to capturing the Seventies Scotland Yard vibe. Though Frank Skinner also had a good hand in that with a spot on performance of Inspector, sorry Chief Inspector Neilson. Knowing how giddy Frank got playing against Peter Capaldi's Doctor, I can just imagine how he felt playing opposite Tom's Doctor. Phil Mulryne takes us to the Planet of the Drashigs in a blood curdling romp. If you squint your ears as you say Drashig World it sounds a lot like Jurassic World, and that's pretty much the premise here, with a collector having brought together every breed of Drashig for his very misguided tourist attraction. We first came across the Drashigs in Jon Pertwee's Carnival In Space, as a formidable "eat through anything" monster, but not something you might imagine creeping up on you. Mulryne's version of the Drashigs includes never before heard of breeds, such as the smaller Emerald Drashigs, which nicely fit into the Velociratpor niche, bringing some peril to the proceedings. That and the fact that Dan Starkey, better known as Strax, gives the Drashings a chilling new voice. Simon Barnard and Paul Morris then give us quite a change of pace with their Gothic Ghost story The Enchantress of Numbers, set right on my doorstep in Papplewick. The tale explores the history surrounding mathematician and computer programming pioneer Ada Lovelace and sees her being haunted by her father, Lord Byron. Guy Adams takes us on the last couple of sprints on the journey with The False Guardian. A story rich in Who history, featuring a returning monster, planet and arguably a couple of characters from a well loved Hartnell saga. I won't give away which, but there is a big clue on the cover. Of course one other tell tale sign on the cover is "Volume 1", which means only one thing, that gatekeeper of Saturday evenings, the cliffhanger. So you'll have to wait a month for the conclusion in Volume 2. Of course no time machine can work without its crew, and we've already mentioned we have the incomparable Tom Baker in the lead role, sounding every bit as much the galactic Bohemian that he ever was. It's worth noting that Volume 2 of this season will take Tom to within 8 episodes of having reached the same number of episodes with Big Finish, that he managed on TV, so it's all record breaking from here on in. Joining Tom is the loyal K-9, once again lyrically voiced by John Leeson. It's ironic that in the TV days Matt Irvine strived to make a quieter K-9 to stop the noise of the motors drowning out dialog and music, but now in the days of audio Who, that noise is one of the things the sound designers can exploit to let us know what K-9 is doing. Having succeeded quite noticeably at one point, K-9 Mark I was left on Gallifrey in the Invasion of Time, with the Doctor sliding out the new quieter K-9 Mark II in a box at the end of the story. Just to avoid too many over eager fans complaining about the change in noise. But that box with K-9 Mark II in is very important in the context of this box set, because that's where we start, in the gap between Invasion of Time and Ribos Operation, we get to meet the Fourth Doctor's new companion WPC Ann Kelso, superbly portrayed by Jane Slavin. It's like Jane got in that time machine and traveled back to 1978, because she fits perfectly, both as the Doctor's new companion, and K-9's new mistress. The character also fits with the era's attempt to give female parts more substance, with Investigative Journalists, Warriors, Time Ladies and now a WPC, just at the point in time where women's numbers finally start to swell in the UK Police Force. One very noticeable line is where in the past the Doctor may have valiantly told his companion to stay here out of danger, here he tells Ann to stay here and protect the prisoner. A very strong and credible character that I'm looking forwards to hearing much more of. 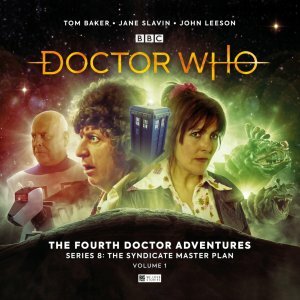 The Syndicate Master Plan Vol 1 from Big Finish takes the huge scope of four tantalising Fourth Doctor stories, and expertly squeezes them between your ears - It's almost like it was bigger on the inside. 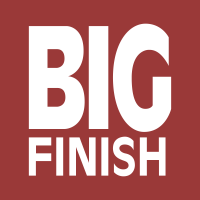 As it starts with a new companion, it also makes a great starting point for anyone wanting to try Big Finish for the first time. You can buy The Syndicate Master Plan Vol 1 directly from the Big Finish website, either on CD or download. For every CD purchase a download version is also included, which can be played by the Big Finish App.